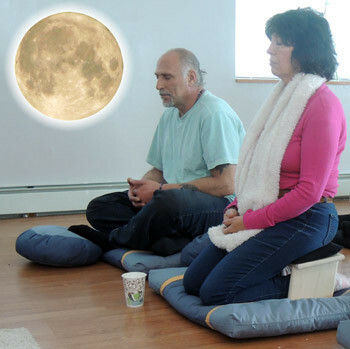 The Compassion Center will host a Full Moon Meditation on Monday, February 22 from 7:45-9:00pm. We will harness the power and luminosity of the full moon to crate a very powerful experience. This will be the first full moon Meditation since The Compassion Center opened, so we have something very special planned. But I won’t tell you what it is. You’ll simply have to show up for Meditation class and experience this for yourself. Be prepared to be be very moved. Some will cry…others will feel incredible joy. No matter what emotion strikes you on this very special night, you are sure to enjoy it and will leave The Compassion Center feeling very uplifted. Many meditators use the visualization of a glowing orb to assist them to get into a meditative state. For some, this moon-like object suddenly appears and then allows the meditator to turn their focus inward and commence their meditative state. Imaging looking at the full moon before you arrive at a Meditation class, gazing at this for a few minutes, taking a snapshot inside of your head, and then heading into a Meditation class. The full moon can make a wonderful aid to assist a person to get into a deep meditative state. A full moon has some very profound effects on some people. For some, it energizes them. For others, it brings out a very different person from what that person normally is. It is possible to harness your experience and to use this to deepen your Meditation. We look forward to this every special evening at The Compassion Center. You can purchase a Meditation class ticket here.